Economy Spread (and Cookieposter, part III). Last Friday, I took time to rummage through the basement of one of my favorite antiques stores. That floor in the building specializes in mid-century art and antiques, and has several book sellers. I have a weakness for old cookbooks, especially the free-with-appliance and local electric company types, even though I try to exercise caution lest my house be uncontrollably filled with paper clutter. 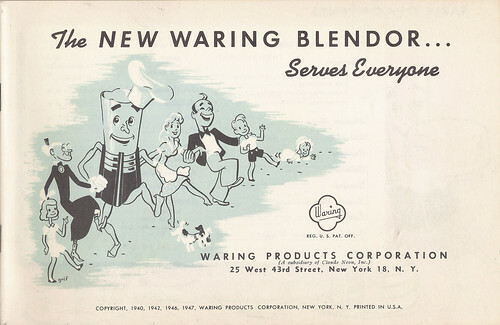 I limited my purchase to two: The New Waring Blendor Serves Everyone (yes, blender is spelled blendor), and Foods Children Love. When I was paging through the recipes for "Vitamin-Full Appetizers" and "Main Course, Tube Feedings" that purport to be "useful in feeding convalescents and the aged", I ran across a heading called Bread Spreads. When I was a kid, my Mom would grind ring bologna together with her home-canned dill pickles in an old-fashioned steel meat grinder that attached to the counter top. It was one of my favorite things; we called it Ground Pickle and Bologna. It was mixed with a healthy amount of Miracle Whip, and we happily ate it up. I still love this, though in my adult life, I've noticed that wherever I've happened to see it, it's called Ham Salad. In the health conscious 90's, I think my Mom probably switched to using ham, though I would have to ask her the last time she made it. I never guessed that it must have been born of the frugality of depression era parents until I saw the recipe posted in the Waring Blendor cookbook as Economy Spread. In this recipe, you would use 1/2 cup of mayonnaise to 1 cup your meat of choice and simply use your Waring blendor to blend it. After I made another loaf of American White Sandwich bread this morning, I knew I'd have to whip up a batch of the purposefully named Economy Spread. I prefer to coarsely chop the pickles and ham by hand, and only add enough mayonnaise to help it stick together. I'm imagining that homemade mayonnaise would make this dinner party worthy, but maybe only as canape style appetizers. Sasa, please leave a comment and let any interested readers know about your version, in which she adds sour cream instead of mayonnaise. Of course, I was so excited at the prospect of eating this on the fresh heel of the bread that I forgot to photograph it until I was almost finished. It may be a recipe born of unusual necessity, but it certainly is one of my favorites. Ruggulach, a recipe from Mostly Foodstuffs. I love other's family recipes, and this one from Deena's family was really good. I actually bought some Apricot jam, since that wasn't in my canning calendar this year. I'm planning to remedy that next year. I did make half with the Apricot jam and half with a Strawberry-Cointreau jam that I made last summer. They look so elegant and fussy, even though they are pretty easy to make. The only addition I could see fit to make would be to add a pinch of salt to the dough. Almond-Orange Biscotti. I have always been jealous of Elisa, since every year she makes amazing biscotti as gifts. Of the last 3 years, this batch pictured above, is the first recipe I've made that I would be proud to send her. It is properly biscotti: crunchy, but not tooth-breaking, and has enough butter to give it some body. Orange peel, almonds and almond extract are the additions that really make this one of my favorites for 2009. This was another Cook's Illustrated recipe. It can be found in The Best Recipe, one of my most consulted resources. I have a busy end of the week now, with some cooking and baking scheduled for others and even a Christmas party in the mix. I have my oven on self clean as I type, so it can be properly prepared for the work it will be allotted. And I have got to make time to get to el Rey, those tamales can not make themselves and I need chiles and hojas! If it is one thing I'm guilty of, it is careful planning. Tamale building will begin on Monday, and I hope to complete the last of my Mexican cookery tasks by Wednesday. It's hard to believe we're staring down the barrel of the end of the year. So often I hear my Mom's voice telling me long ago that in her 30's, the years came in clumps. I can identify with that now, whereas I couldn't quite grasp it when she first told me. Each day is so packed with activity, and each one slips away faster than the last. What powerful reminders to enjoy each second when you have it, and to appreciate each of those around you every day.